We work with companies from both the private, semi state and public sectors, large corporates, SMEs and individuals with back problems. We specialise in supplying ergonomic solutions for the workplace to help clients increase comfort, reduce absenteeism, increase productivity and comply with Health and Safety obligations. We work very closely with ergonomists, medical and health and safety professionals, architects & designers, facilities management specialists, to ensure the best solution is put in place. All our staff are DSE/VDU trained and qualified chair assessors. "They arrived today. Fantastic service. "I’m taking the time to give you this feedback because I have been so impressed with the service and equipment supplied by you and your company. Although you didn’t have experience in ergonomic solutions for people Lymphedema, that didn’t put you off. You did a sterling job! There are not a lot of suppliers with experience in this area and I won’t hesitate to recommend you to anyone with Lymphedema. I will also pass on your details to the Lymphedema Ireland support group. “I Find the chair a vast improvement, offers great lumbar support, I do not slouch like before. Am now off the tablets"
“I am just writing to say thanks for allowing me to “test sit” the RH Logic 400 chair. As I informed you previously to my numerous back problems, resulting from fracturing a couple of vertebra in my lower back a number of years ago. This later caused discs to slip, trapping nerves leaving me in extreme discomfort when sitting for long periods. The result to date is as follows, the sciatica that I experienced before has diminished, and stiffness form getting up from sitting for long periods has disappeared. The support the chair offers for an individual shaped like myself is impressive. The fact that the chair can be personalized for each user and the number of articulations/adjustments available for different tasks while sitting at the desk really brings the whole thing together. Just to say many thanks for the keyboard, its working like a dream. A marvellous invention!!! I had one on loan from a colleague and since I started using it my upper back and shoulder ache has thankfully disappeared." 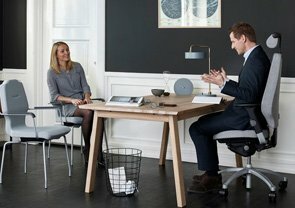 "The new office chair has made a big difference. Between it and the physiotherapy sessions I have had, the upper back-pain has disappeared." "I don't know how I'd manage without it now. It does all the things you said it would do." "Thanks for a very smooth and swift order and delivery process." The moving seat is the answer to a weak base of spine and so I don't mind how long I sit on this chair for that reason. The flexing back of the chair keeps my back in a good posture, as intended, so that's another benefit. Thirdly, the height adjustment, in conjunction with the raised desk adds to its effectiveness, since i have longish legs and standard chairs tend to be low. Although it was a big outlay at first, I do feel that it was money very well spent as it is so naturally comfortable. I now enjoy sitting down at my desk and if I have to sit anywhere else (as happens daily) I can't wait to return to my own chair, it's like changing from heeled shoes to slippers! Thank you for your advice and suggestions. Even the computer slope is beneficial. I dont have cramps in my shoulders from leaning forward at the desk now"
"We are delighted with the lab chairs. Many thanks"